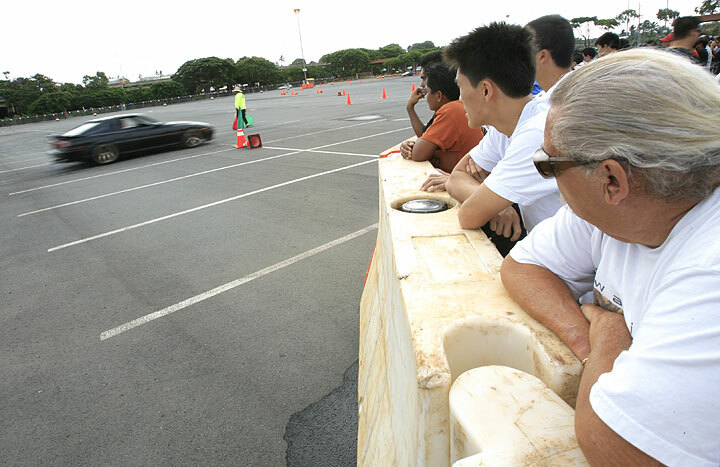 A state lawmaker is organizing a campaign against "drifting" car events at Aloha Stadium. Rep. Lynn Finnegan (R, Lower Pearlridge-Aiea-Halawa-Hickam-Pearl Harbor-Moanalua Gardens) said she wants to stop drifting at the stadium because of the noise, smoke from burning tires and safety issues. In a letter sent to residents near the stadium, Finnegan said a survey showed 25 residents are bothered by the noise or do not support drifting there, compared with 14 who support it. Drifting is a type of racing that involves oversteering and sliding through turns to maintain momentum. Xtreme Drift World Tour, or XD-1, has held two events in the stadium parking lot this year during a trial period, including a two-day run that ended yesterday. Tracy Arakaki, president of Xtreme Drift, said residents' complaints about drifting are unfounded. The noise is drowned out by traffic on Kamehameha Highway, he said. Noise tests of the burning tires and revving engines reached 92 decibels from 20 feet away. "It's a bad idea for them to ban the drifting (at Aloha Stadium). That's not trying to work with someone. That's just wrong," Arakaki said. "It's something they don't know anything about. It's something new so automatically people always try to shoot down something new." Finnegan said it's the type of noise that bothers residents. "Screeching is not an easy thing (to endure). It's an uneasy feeling when you are hearing the noise," she said. It's not like hearing music or cheering from sporting events, she added. Arakaki hopes to hold two large events a year as well as smaller monthly drifting events. Arakaki said he's trying to be a good neighbor by ensuring safety with rules and ending the event by 9 p.m. out of deference to nearby residents. Finnegan acknowledged the cooperation of the drifters organization and said she supports helping them find another place to race. "They've been at least understanding of some of the concerns from our office in speaking with them," she said. "They were anxious to work with the community and have been open to working with us." Finnegan said she supports House Bill 567, which would require the state to determine the cost of developing an all-purpose motor sports facility. She's encouraging residents to turn out for a hearing on the bill Wednesday. But she's also organizing neighbors to testify against the drifting events at the stadium during the next Stadium Authority meeting on Feb. 22.